Order your Platinum Maki-E Crane Fountain Pen today from FahrneysPens.com. Fine Pens, Refills & Luxurious Gifts – great prices & fast shipping. For centuries, the timeless art of maki-e has brought to life the intricate depth of Japanese history and culture. Platinum offers maki-e from renowned and respected artists who have developed their skills over a lifetime. The Flying Crane fountain pen depicts the soaring bird that symbolizes peace and good fortune. The design is created by hand using layer upon layer of urushi lacquer, gold dust, vibrant color pigments and abalone shells. 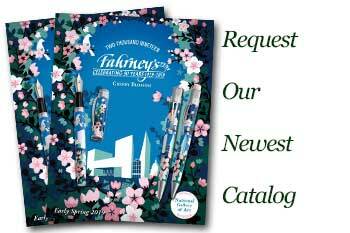 The Flying Crane maki-e fountain pen is a Fahrney's Exclusive! It has an 14K gold nib . Each pen is presented in a traditional Japanese wood gift box. Cartridge/Converter fill.